The BLANCO SOLON sits attractively atop the counter for composting convenience and design appeal. With a new generation of “going green” enthusiasts coming into the housing market eager and ready to purchase their first homes, we’ve seen a rise in things like energy efficient appliances, solar paneled roofs and even kitchens equipped with their very own recycling and composting systems. 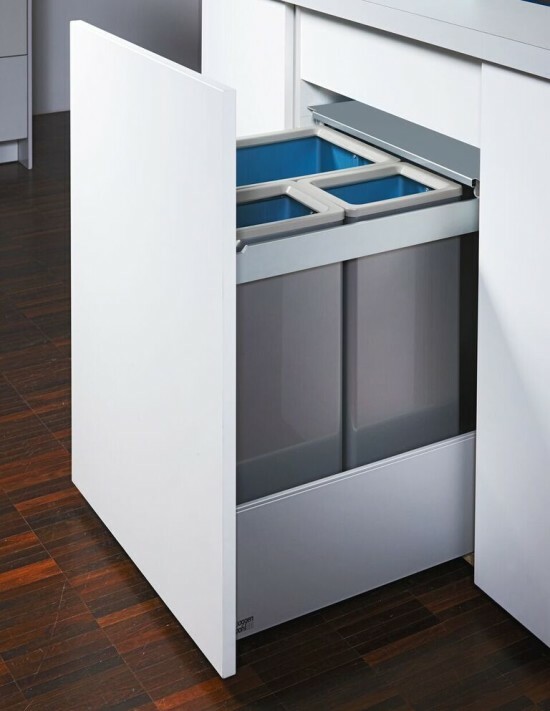 As designers brainstorm new ways to appeal to their growing green-friendly market of buyers, many are jumping on the bandwagon and incorporating composting systems such as the BLANCO SOLON™ and products like integrated pull-out trash systems into their kitchen designs. While recycling and saving the planet is a cause everyone can get on board with, these new environmentally friendly kitchen additions sometimes come with an issue of state regulations and rules for designers, architects and homeowners to abide by. Some states have gotten fully on board with composting. Massachusetts now requires that any restaurant producing more than 1 ton of food waste per week must separate the waste for composting instead of sending it to the state’s rapidly shrinking landfills (bostonglobe.com). Some states and municipalities actually require a permit for any on-site composting done within a business or home to prevent composting from being a nuisance to neighbors and also to ensure that nutrients and food waste are not being released into groundwater or nearby lakes and streams (dnr.wi.gov). Nearly 100 cities, including San Francisco and Portland, now divert food waste from landfills by offering curbside composting programs that have saved millions of tons of garbage and waste per year. The motivation for these programs is simply the lack of space in landfills around the country (governing.com). In these composting cities it is now becoming a must for designers to engineer composting systems into their home designs – and it is not far off that many cities around the country will continue to follow suit in the future. In states like Wisconsin, there are no regulations for home composting operations fewer than 50 cubic yards, but composting is expected to be done in a manner that causes zero disturbance. Most states have begun to encourage on site and at home composting as they have found it heavily decreases the amount of waste going to landfills each year. While there are some regulations that must be followed based on the size of the property in which the composting is taking place, most municipalities and states will allow designers to install composting and recycling systems within the home without hassle. 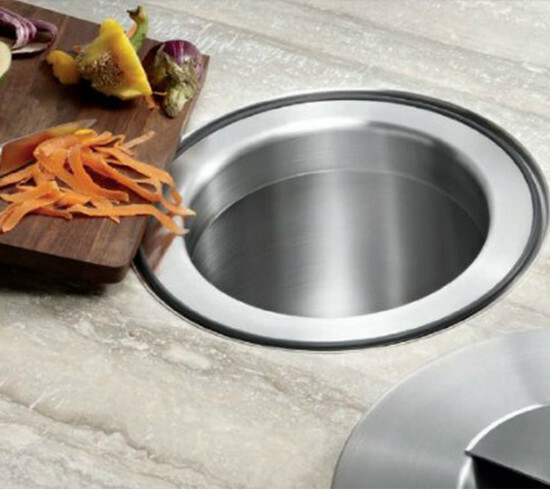 Composting is a fairly simple process that can be made simpler with systems like the BLANCO SOLON™. Ideal for designers as its lid sits attractively atop the counter without being an eyesore, the SOLON collects waste under the counter and lifts easily to empty and wash. The attractive lid keeps odors inside. The recycled stainless steel bin can be conveniently installed next to the sink and is the winner of the prestigious international iF award for product design. With more and more people becoming environmentally conscious and more research proving how necessary recycling is to our well being, the trend of eco-friendly homes seems to be here to stay. Designers and architects alike now have wonderful products to choose from like the SOLON to hopefully encourage them to keep the environment in mind when building and designing! 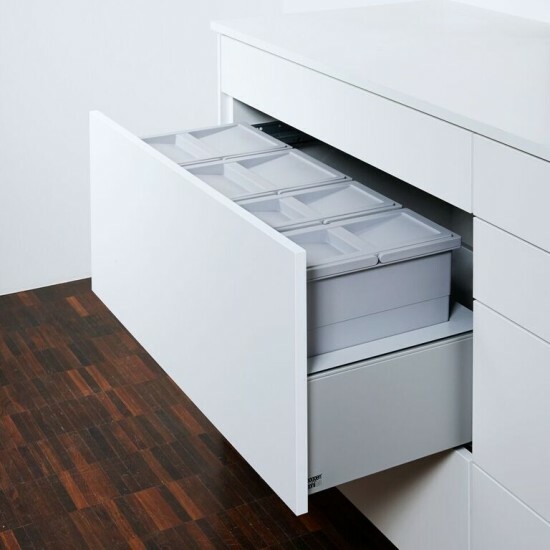 Poggenpohl’s pull-out waste bins allow waste to be organized and kept out of site under the counter in attractive storage systems.